Web site: www.mountaineerflies.com Carl is an Industrial Forester with a passion for fly-fishing and fly-tying. His home water is the beautiful South Branch of the Potomac River in West Virginia, where he also has a small business called Mountaineer Flies. One of his biggest fly-fishing thrills was catching and releasing a 5.8 pound smallmouth in 1996. That Christmas definitely changed my life. It was 1991, and I was not really in the mood for joyous celebration. You see, my little girl was dying of a terrible, mostly overlooked disease, Anorexia Nervosa. She was starving herself to death. The doctors gave her a 50-50 chance to live. The present that Jackie gave her daddy that Christmas was a Cabella's Fly Tying Kit. It had a vice, bobbin, bodkin and a few other things. I told her that I loved it. But it was only she that I loved. Jackie recovered and has moved on to be a Graphics Designer and married a great guy. She has a son and a happy life. A year or two after Jackie's recovery, I found that little kit buried on my workbench. I looked at it again and all the memories came back. I really didn't know anything about the tools and other items in the kit, but I spent a Saturday figuring them out. 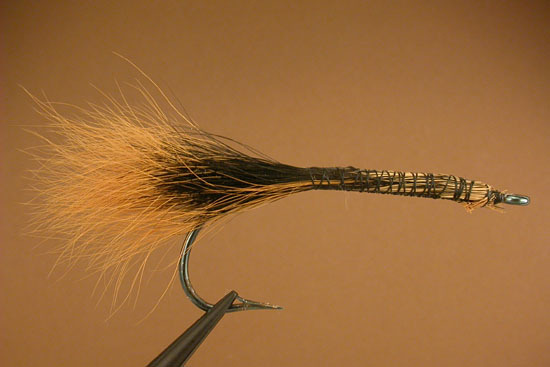 I knew nothing about fly tying even though I loved to fly fish. I borrowed some thread from my wife, used some hair from a fox squirrel, lashed the hair to a bait hook (3/0) and hurried to the South Branch. I loaded the leader with split shot and "let fly". On the second or third try I hooked, landed and released a smallmouth. On my own fly! Needless to say, I was hooked at fly tying and have been ever since. Thanks, Jackie. I love you. PS, Jackie designed the logo for Mountaineer Flies while in college. You can see it on my Web site.